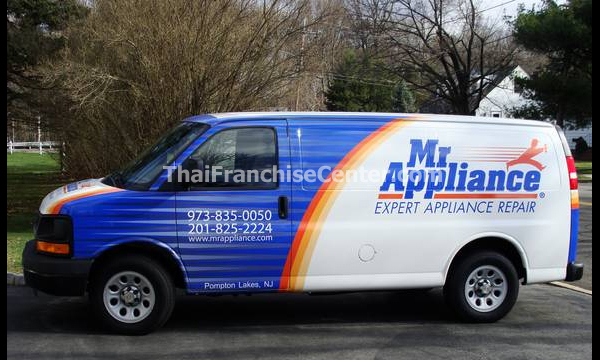 Mr. Appliance is the world’s largest appliance repair franchise organization. We’ve been helping people build better businesses since 1996 so they can achieve their goals. History In a word, experience. Mr. Appliance is the world’s largest appliance repair franchise organization. We’ve been helping people build better businesses since 1996 so they can achieve their goals. The systems that Mr. Appliance has built would take an individual years of time and tens of thousands of dollars to replicate. At Mr. Appliance, we know there's never a convenient time to have household or kitchen appliance issues. That's why our goal is to provide quality appliance repair service in a timely and honest manner -- a combination that has made us the first choice of many residential and commercial clients worldwide. We promise to respect your home and give you a solid quote before the work begins so there are no surprises. Total investment range:$47,350 - $99,120. Marketing – through target marketing and our national brand, we help you find the highest quality customers. Our marketing support includes social media, local SEO, and professional marketing materials. Operations – our operations support is all about making you more efficient through technology. For example, franchisees have access to a call center to answer customer calls 24/7. Management – we help you develop your team through best practices in recruiting, hiring, compensation and retention. In addition, we provide you with the support of a Franchise Consultant who partners with you to help you achieve your goals. Finance – you will have access to detailed statistics and financial reports for your business, as well as peer and industry averages to see how you compare. Mr. Appliance® Franchise Opportunity_2Through our ProTradeNet subsidiary, we are able to negotiate significant discounts with many vendors that will reduce your expenses. Technical – we will provide you with many opportunities for training to sharpen your skills. Training occurs in many forms: face-to-face (local, regional, national), on-line, and from other franchisees in the network.